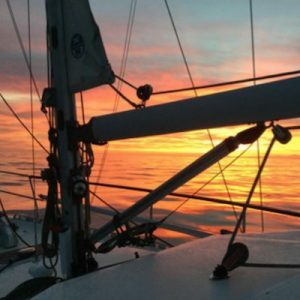 Enjoy an early start to the sailing season as we emerge from winters short days and long nights to summers long days and short nights . 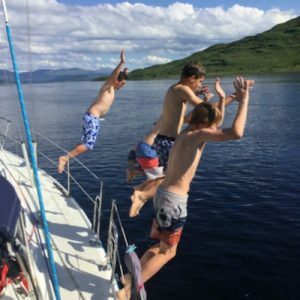 Bluebird sails the Clyde estuary and through the enchanting Kyles of Bute into the more open waters of Loch Fyne to Portavadie Marina where guests can relax and shake off winter blues in the warm outside jacuzzi and infinity pool. 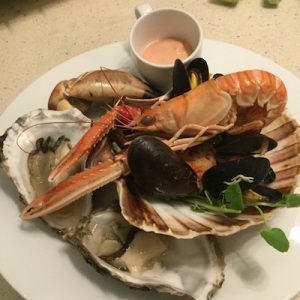 On board menus might feature Scottish shellfish locally caught from the Gin clear waters of the area such as scallops, lobster, langustines, crab, oysters and mussels. 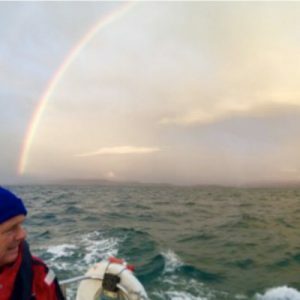 The draw of Scottish single malt whisky can be made a reality when Bluebird sails across the waters of the outer Clyde estuary to Arran where guests can enjoy a tour of the Arran distillery by an experienced guide whose passion and knowledge is inspirational. Sailing North West in early Spring weather can be a wonderful experience especially with a fair breeze and bright sunshine. 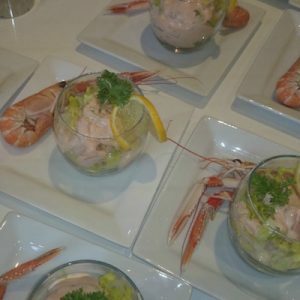 Our experienced skipper will navigate Bluebird into the sheltered bay of Millport where shoreside exercise can be enjoyed by cycling round the island of Cumbrae while enjoying the island at close quarters with abundant wildlife. When sailing down the West side of Little Cumbrae Bluebird will pass the lighthouse built by Robert Stevenson, (a relative of Robert Louis Stevenson), in 1794 This lighthouse was the first to be built by the Stevenson family on Scotland’s West Coast. Bluebird sails to Arran for hill running practise and pre race sail training for the Scottish Islands Peaks Race . A short passage across to Arran where the fell runner can put passion into practice on the slopes of Goatfell and the surrounding mountains. The East and North West coasts of the island also offers good shelter in Loch Ranza, Brodick Bay , Holy Island and Lamlash with opportunities to drop runners off at one port and pick them up again at another. 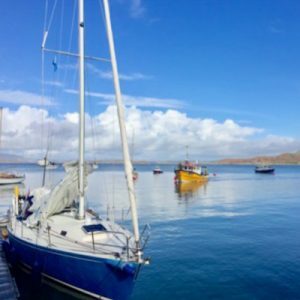 As daylight hours increase and air temperatures begin to rise Bluebird will sail North West through the enchanting Kyles of Bute and into Portavadie Marina which lies on the East side of Loch Fyne. 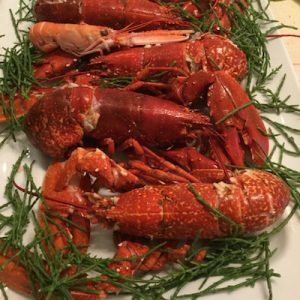 Locally caught seafood can be enjoyed and prepared by your on board chef who delights in serving his guests with dishes such as, Fruits de Mer which includes, scallops, lobster, crab, langustines, oysters and mussels. The scenery at the North end of Arran is dramatic and there could be an opportunity to visit the Arran distillery and learn how the amber gold whiskey is created. 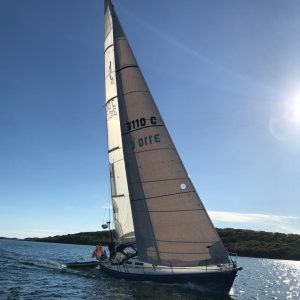 Bluebird joins the fleet of yachts in an adventure race for teams of sailors and fell runners on and around the most beautiful parts of the West Coast of Scotland. 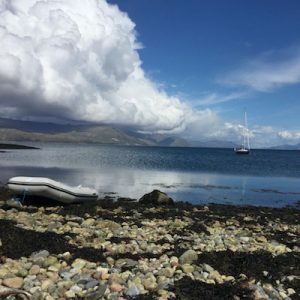 Starting at Oban when the runners take part in a six mile land race around the town then sail to Salen on Mull to race on the mountain of Benmore . After an overnight sail to Craighouse on Jura the runners disembark to scale the heights of the Paps before heading of to Arran via the Mull of Kintyre and running Goat Fell on Arran . The final leg is across to the mainland at Troon where the race finishes. Parents and supporters welcomed the yachts Bluebird and Damsis into Troon marina on Sunday 21st May after the Scottish Islands Peaks Race 2017. These two Fettes boats were first and second in the youth class; and eighth and ninth in the overall results. These are the best places we have ever achieved. The race started in Oban on Friday with Mark Bushby piping to the crowds from the foredeck of the good ship Bluebird. There was a nasty moment when the enemy catamaran Obedient collided with the good ship Damsis during the start, but the damage was not enough to deter the dauntless Captain Tom Watson and both boats set off for Mull. After an afternoon’s sailing, both Fettes teams set off within a minute of the Glenalmond runners. Mark Bushby and David Sinclair finished first, followed by Evan Li and Matthew McKenzie in second. Bluebird was therefore in the lead… until Damsis sneaked ahead at the island of Fladda, when the tide turned against the fleet and the yachts had to drop anchor to avoid being swept backwards. Captain Laurie Mill, leading from the front, got out the rubber boat and towed all 7.5 tons of Bluebird out of the tide while dolphins cavorted around us. 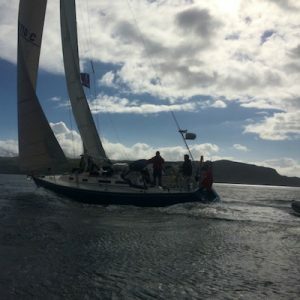 On Saturday morning, Bluebird regained the lead as the boats headed for Jura, but the good ship Damsis caught up and was about to overtake when Bluebird cut a corner by dodging around the back of the Small Isles to drop off the runners first. James Axon and Ed Selwyn Sharpe remained just ahead of Georgii Polonskii and Mungo Milne on the pathless wilderness of Jura. As the sun set over the hills of Jura, Bluebird beat into the night just ahead of Damsis. 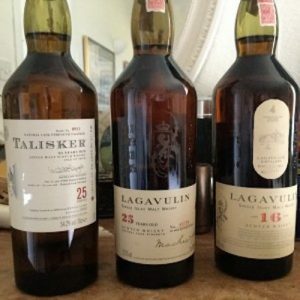 Both yachts slowed down as a vicious squall came out of the darkness, and by the time the fleet rounded the Mull of Kintyre, Damsis was once again ready to pounce. 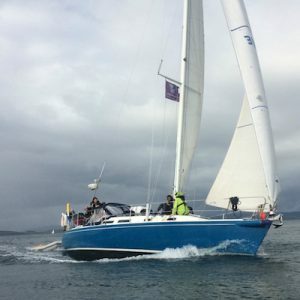 Bluebird deployed their extra spinnaker sail and pulled ahead until the sail fell in the water as the wind increased on the approach to Arran. Yet again team Damsis, having sailed slightly faster on the sailing leg, landed their runners just behind Bluebird. Mark Bushby and David Sinclair, running for the second time, just held off the running challenge from Breagh McMillan and Stefanie Tucker. Bluebird bobbed across the Firth of Clyde to finish in first place. Finally, our skippers Tom Watson, captain of Damsis, and Laurie Mill, master of Bluebird, put huge amounts of skill and determination into the SIPR. Conditions this year were not stormy, but they were very demanding as the weather toyed with the fleet. These men undertook the responsibility of navigating their own boats through some pretty intricate voyages for more than 55 hours. 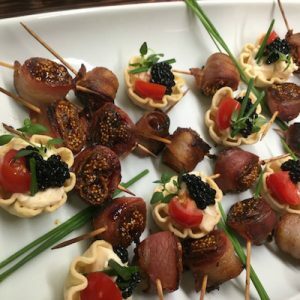 The SIPR is really an adult event. I was very proud of the way the Fettesian youths and adults rose to the challenge. The SIPR is the sort of event that people remember for a very long time. 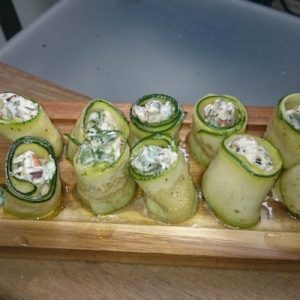 It is the sort of event that teaches people a great deal. Sit back, slow down, admire the view and experience North West Ireland’s coastline which has some of the most unspoilt cruising grounds in the world . From Ballycastle Marina to Rathlin Island ,(where Robert the Bruce in 1306 is said to have hidden in a cave here for 3 months), to the sheltered harbour of Port Rush . 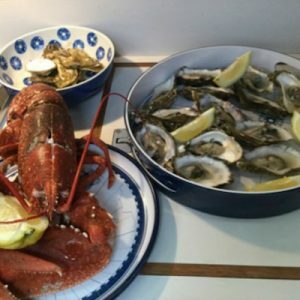 The maritime waters of North West Ireland including counties of of Donegal and Sligo can be experienced when Bluebird sails her coastline stopping at enchanting sheltered bays and enjoying the local seafood. 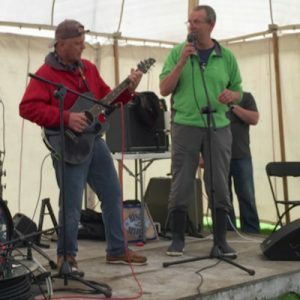 Bluebird joins a fleet of other yachts taking part in an organised cruise in company to St Kilda starting on the East side of the Outer Hebrides where shore side entertainment can be enjoyed with like minded sailors. It is the aim of the organisers that all yachts of the flotilla have the opportunity to actually stop at Village Bay at St Kilda, drop anchor and be ferried ashore to explore the amazing abandoned cottages – a truly unique place to visit . 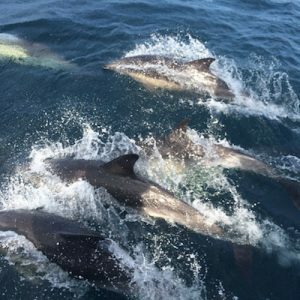 The cruise begins with a two day passage to North Uist stopping at one of the many sheltered ports on the West side of Sky with its dramatic scenery and abundant wild life. Bluebird will then join the other yachts at Loch Maddy Marina before the cruise in company heads out to St Kilda. NOTE: ALL CRUISES GENERALLY START AT 10:00 ON THE FIRST DAY AND END AT 17:00 ON THE LAST DAY ALTHOUGH WE CAN BE FLEXIBLE WITH TIMINGS.